Deep UV-LEDs for Quick Water Disinfection | R&D Report | Research and Development | NIKKISO CO., LTD. In 2014, professor Isamu Akasaki of Meijo University and professor Hiroshi Amano of Nagoya University et al. were awarded the Nobel Prize in Physics for blue LEDs. 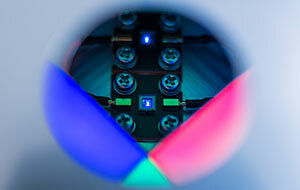 The professors had already begun research into "LEDs to succeed blue LEDs." They are deep UV-LEDs. The deep UV-LEDs create light of a shorter wavelength that cannot be obtained by conventional LED light sources, allowing the effects of disinfection, air purification, etc. In the past mercury lamps had been used for such applications. However, mercury lamps require high power consumption, and are harmful to the human body and environment. On the contrary, deep UV-LEDs have low power consumption, a long life, and no harmful effect on the human body. 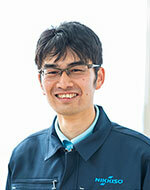 Nikkiso's development staff took on the challenge of productization for this technology. 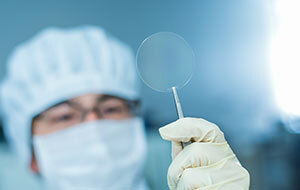 The biggest task in developing deep UV-LEDs was, how to achieve high-power light. Yusuke Matsukura, who is in charge of developing chips in the UV-LED Business, stated that, "Since the deep UV-LEDs were different from regular LEDs, it was necessary to make the structure of a chip that matched the deep UV-LEDs." Normally, LED light is emitted by making a PN junction where the n-type layer and p-type layer are joined and the current flows through there. However, in the case of deep UV-LEDs, the chip is manufactured mainly using AlGaN material and growing the crystals. Although there was a case where the "wafer glowed tremendously" (Matsukura) in the experiment, the wafer did not glow even afterwards even when created with a method, and then trial production and analysis was repeated for about half year. "Although several months passed before we identified the cause, we happened to take notice of the idea that the cause might be an influence of a certain material that our company newly introduced, and we tried to create wafers by changing the conditions in various ways." (Matsukura) As a result, the glowing wafer was reproduced. 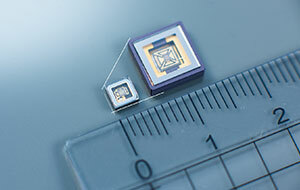 Thus, development of the High-powered deep UV-LEDs took a step forward. * Making the p type AlGaN denotes adding an impurity that operates as the p type to the AlGaN, and creates the p-type semiconductor. Although the method make the deep UV-LED light steady was known, the next development theme was "How to get that light out." 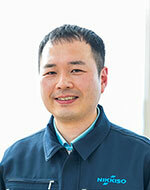 The group leader of the Package Manufacturing Group, Keiji Ichinokura addressed the task. In order to enhance the light, a resin sealing package is used for ordinary LEDs. However, in the case of deep UV-LEDs, similar conventional material cannot be used because the resin material itself deteriorates under the influence of the deep ultraviolet rays (DUV). Then, the Ichinokura Group selected a package that doesn't use resin. Although the water disinfection module of "2 L/min," applicable to drinking water at home, etc. was already at the end of the development stage, the ability to process even larger amounts of water, namely 50 to 100 L/min, is required in the case of water purifying plants. For that purpose, Kiuchi and other members made an array of multiple deep UV-LEDs to enhance disinfection ability and improve the light's use efficiency via the structure of the package. 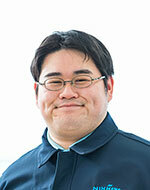 As a result, disinfection ability for 120 L/min or more was confirmed. Presently, demand for safe and clean water is increasing throughout the world, and interest in deep UV-LEDs is increasing as the alternative of mercury lamps, notably in Europe, the United States, and Asia. In addition, regarding Nikkiso's deep UV-LEDs, which are expected to have applications in various fields such as industry, medical treatment, environment, etc., inquiries about the future were posed to three persons.